Right now, I am a boy mom. I usually wear clothing that is comfy, washer friendly and made for an active lifestyle. That doesn't mean I don't like to dress up, it just means I don't usually have a reason or opportunity to. Which brings me to one of the fun things I love about being pregnant. With pregnancy, I am guaranteed at least two opportunities to get dressed up, and look girly and feminine. 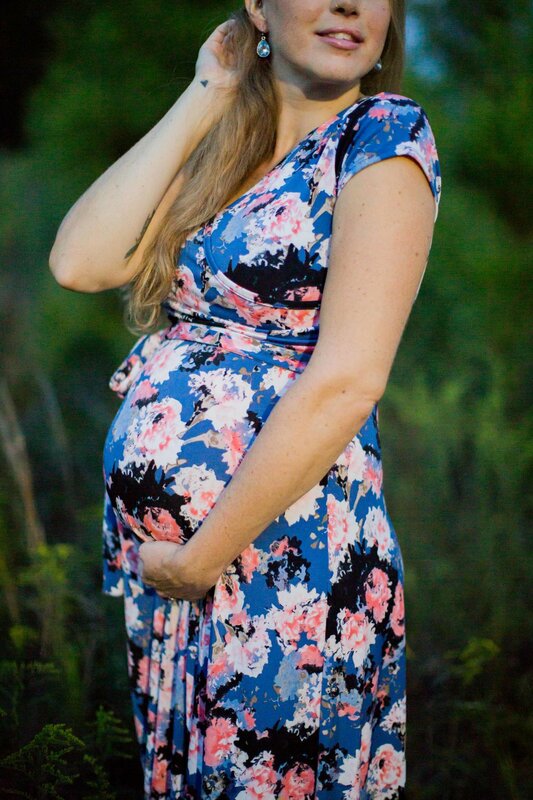 I'm talking about maternity and newborn photo shoots. 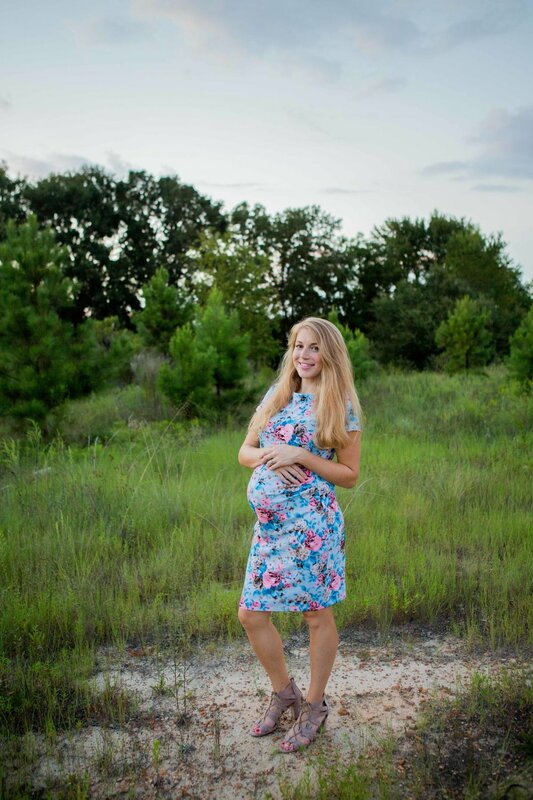 Not everyone will choose to take professional pictures for both of these occasions during their pregnancy, but those who do - this post will be especially helpful for you! In fact, if you plan on going to a brunch, girls night, weddings, church, on a date, or pretty much any other event that requires dressing up, while pregnant, you would certainly benefit from this information too! OK, so what am I talking about here? It's obvious I'm talking about getting dressed up and looking pretty. Well, what is one simple, easy way to do that? Your outfit of course! If you have a killer outfit, everything else doesn't matter (hair, make-up, how you feel). I would like to spotlight the maternity dress. 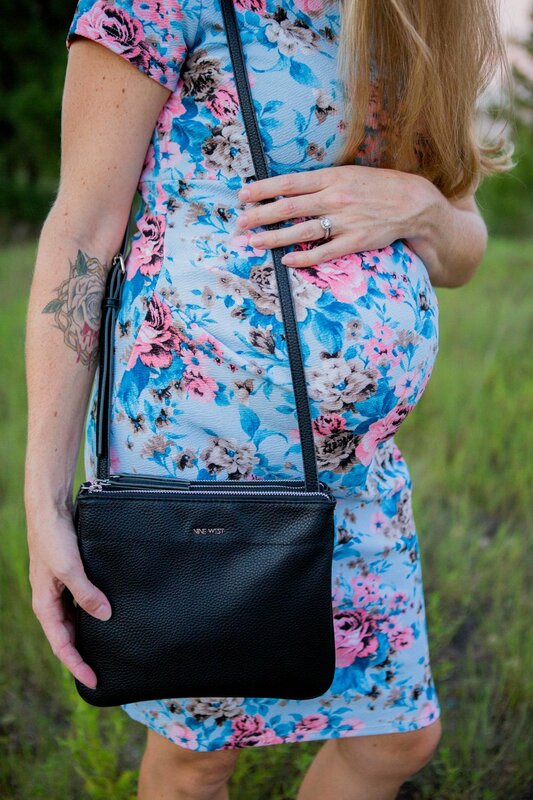 Not just any maternity dress, the most gorgeous, feminine maternity dresses available, from the cutest online boutique around! 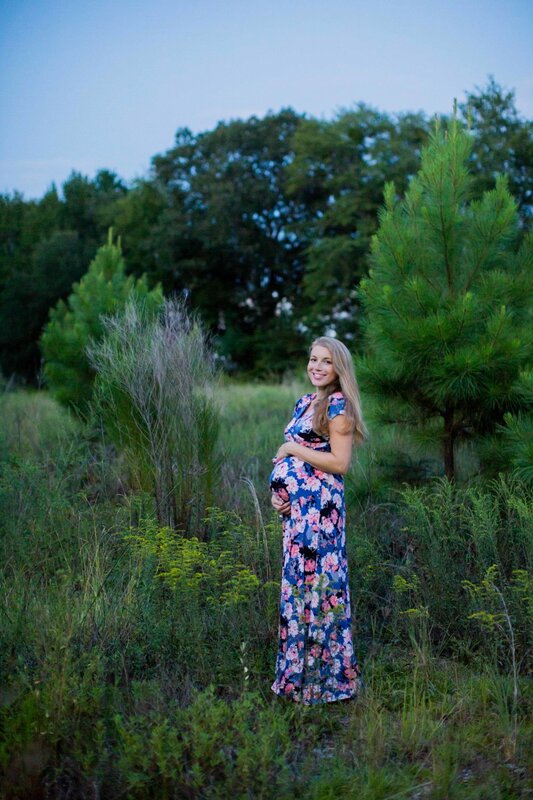 Pink Blush literally has the best styles and prints available when it comes to maternity clothes. Anytime I'm scrolling through Instagram and see an adorable dress (styled in the cutest way possible, of course) it’s almost always guaranteed to be from Pink Blush. 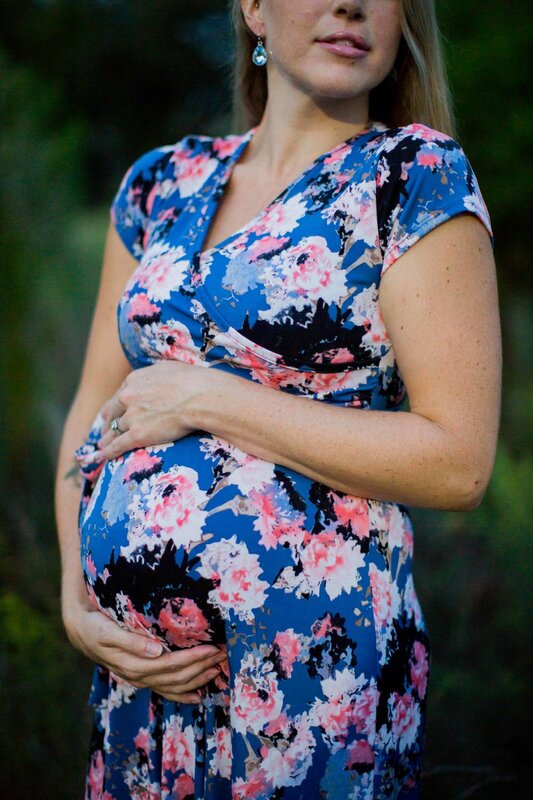 Take for instance this Light Blue Floral Print Fitted Maternity Dress. It's got blue and pink, perfect for representing either gender. And with the multiple colors it's really easy to accessorize. It's such a pretty print and flattering cut. There is built in ruching for a growing bump, so you would not be able to wear this outside of pregnancy. Although the material is stretchy, so it should fit for both the second and third trimesters. The material reminds me of a waffle print fabric. It's 96% polyester, 4% spandex. The ONLY downside to this dress is, it's hand-wash only. I just use that delicate/hand-wash cycle on my laundry machine and it's no problem. But you definitely wouldn't want to mix it with other normal regular setting loads, which makes this dress a little more high maintenance. 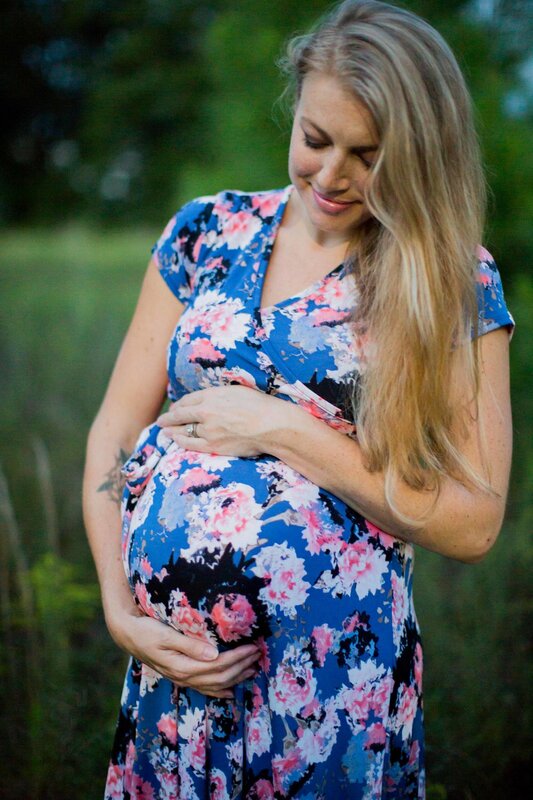 This Blue Floral Short Sleeve Maternity/Nursing Maxi Dress is my absolute favorite style! I was looking for a maxi dress that I could wear in the summer, but would transition into fall as well. The darker colors work perfectly for the autumn season. Plus, the material of this dress is very comfortable. It's smooth, stretchy, and so soft; made of 95% polyester and 5% spandex. This dress is hand-wash only too, so just keep that in mind. It's great for nursing, because of the easy access pull-down top. You could also wear this maxi without being pregnant, which makes it a great value. I know I plan on it! See, aren't these just the cutest clothes you could ever wear during pregnancy? Plus, they have even more maternity items available! They have active wear, (more) dresses, tops, bottoms, delivery robes, swim, sleep wear and nursing pieces! 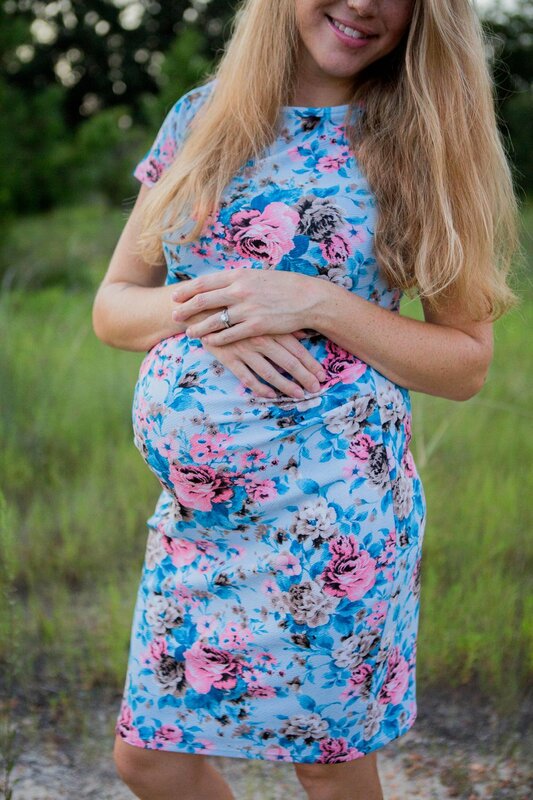 You could literally stock your entire maternity wardrobe with Pink Blush. They also have a maternity plus line, so no one is left out!